Growing up, May Day always conjured up Maypole dances and the smell of beautiful flowers at church festivals celebrating Mary, a reputed virgin mother. I learned that it was the day to celebrate St. Joseph the worker, the patron saint of workers, which I know today only partially acknowledges the importance of the holiday. May 1 has been observed around the world as International Workers Day since 1889, in memory of the protesters killed at Haymarket Square, Chicago, campaigning for the eight-hour workday. The labor activists had set May 1, 1886 as the day for a nationwide strike for better working conditions, but the peaceful May 4 Chicago rally quickly became a confrontation with police and agitators. The “Haymarket Massacre” became a rallying cry for the union movement in the United States and around the world. Through the struggle of those unionists and others who have followed in their footsteps, we have won not only the 8-hour day and the 40-hour workweek, but also overtime pay, fair labor standards and protections, job safety regulations, and laws that allow us to bargain with employers over pay and conditions of work, including pensions and health care. So, May Day is something to celebrate. It doesn’t require a march with the trappings of war, as the despots in Moscow, Beijing and Pyongyang have staged, or even with bullhorns and protest signs at the local Wal-Mart – although that would be appropriate. But it does require an understanding that nothing will be won in our society without a unified struggle against the corporate powers that control industry and, to a great degree, government. 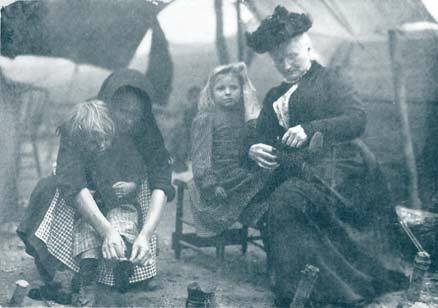 Mother Jones, right, helps a little girl with her shoe at the tent encampment of miners in Ludlow, Colo., in 1886. It’s also a good time to remember those who have paid the ultimate price in the pursuit of economic justice – not only at Haymarket Square but also in other seminal labor fights. This is a time when the United Mine Workers honor the memory of the 66 men, women and children who were killed in April 1914 in an attack on striking miners’ camp at Ludlow, Colo., and in the protests that followed – one of the deadliest labor confrontations in our history. The attack on the miners, orchestrated by oil baron John D. Rockefeller Jr. and a detective agency he hired, with the assistance of the governor of Colorado and the National Guard, is one of the saddest chapters in the long-running war on organized workers in this country. While the violence may have dissipated over time, corporations still take no prisoners in their systematic assault on worker rights. “All day long the firing continued. Men fell dead, their faces to the ground. Women dropped. The little Snyder boy was shot through the head, trying to save his kitten. A child carrying water to his dying mother was killed. By five o’clock in the afternoon, the miners had no more food, nor water, nor ammunition. They had to retreat with their wives and little ones into the hills. Louis Tikas was riddled with shots while he tried to lead women and children to safety. They perished with him. “Night came. A raw wind blew down the canyons where men, women and children shivered and wept. Then a blaze lighted the sky. The soldiers, drunk with blood and with the liquor they had looted from the saloon, set fire to the tents of Ludlow with oil-soaked torches. The tents, all the poor furnishings, the clothes and bedding of the miners’ families burned. Coils of barbed wire were stuffed into the well, the miners’ only water supply. “After it was over, the wretched people crept back to bury their dead. In a dugout under a burned tent, the charred bodies of eleven little children and two women were found – unrecognizable. Everything lay in ruins. The wires of bedsprings writhed on the ground as if they, too, had tried to flee the horror. Oil and fire and guns had robbed men and women and children of their homes and slaughtered tiny babies and defenseless women. Done by order of Lieutenant Linderfelt, a savage, brutal executor of the will of the Colorado Fuel and Iron Company. The UMWA’s two-day centennial anniversary event at Ludlow May 17-18 includes family activities including a simulated coalmine, a craft area for kids and performances by local musicians. Noted authors and academics join political and labor leaders in addressing the crowd. For more information about why Ludlow matters, check out this article in The New Yorker. This entry was posted in Uncategorized and tagged Arlo Guthrie, Cecil Roberts, centennial anniversary, Colorado, Haymarket Massacre, Haymarket Square, John D. Rockefeller Jr., labor movement, Ludlow Massacre, Mary Harris "Mother" Jones, May Day, UMWA, United Mine Workers of America by bymichael2012. Bookmark the permalink.